You are currently browsing the Archaeofacts.com archives of Musings for the day Monday, October 9th, 2017. We went out for a wander around in-town neighborhoods…despite the drippy drizzle we’re still experiencing from the TS Nate system. 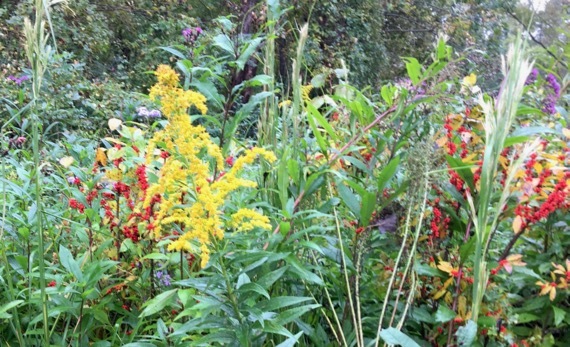 Down a dead-end road we found a wee park with autumn color…goldenrod, red berries of some kind (not the noshing kind), and purple flowers (asters?). I spotted this dragon from afar…let’s go over there, I said to the Guru-driver. And next to the dragon, blue shapes…which I studied until they became shark-parts. And off to the left, um?, a stylized pirate ship, sinking to join the partial sharks? 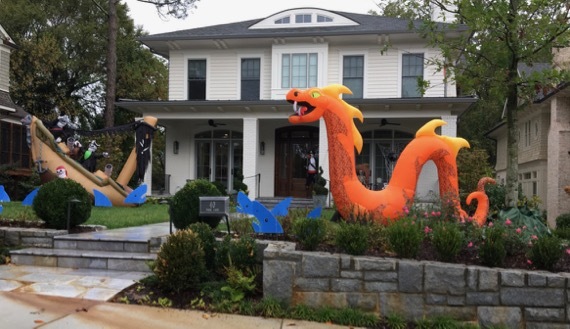 I’m a-learning the current creature-associations with the October-end holiday…used to be ghostly and potentially dangerous human-spirits somehow linked to the harvest-time, now it’s pirate ships and colorful sea-dragons? And huge black spiders…not pictured. AKA cultural evolution….